As Ireland’s leading Developer of Funeral Directors Websites, Handyweb.ie has the expertise and experience to deliver a quality, Mobile-friendly, SEO-ready and easily customisable website that reflects the best attributes of your services. We are happy to discuss your Funeral Home Web Design with you! Collected from all our past experiences of Funeral Home Website Design, here are few Frequently Asked Questions from our customers that you may find useful! I have no website. What do I do? Talk to us now for a free consultation! We provide Website Services in Ireland, tailored to your needs. I have an old website. Do I need a website restyle? We are always available to offer free Website Redesign tips, providing before/after examples from our past work experience. Whether you would also like to take advantage of our Website Redesign Service or not is entirely your choice. Is my website mobile-friendly? Why is it important? If you are not sure whether your website is mobile-friendly or not, just take this quick test from Google and check right away. Ever since the release of the so-called “Mobilegeddon” algorithm update, Google started penalising websites that were not easily browsable by a mobile device by making them rank worse in their Search Engine Results Page. Contact us right now for advise on how to switch to a Mobile-friendly Responsive Design! What do I do after I have a working modern website? HTTPS security – In their quest for a safer browsing, Google Chrome and Mozilla Firefox are already displaying whether a website has HTTPS security in place or not. As more and more websites are putting such security protocol on their websites, it seems to help them rank higher in Search Engine Results Page. SEO – Search Engine Optimisation helps you reach out your target audience and make them visit your website. Check out our SEO Services! I have seen Obituary pages, Webcam Streaming and unique Visitor Books for the deceased: should I do this? As experts both in building and installation of these services, measuring their usage, we at Handyweb.ie are happy to offer advise on the value and cost of these services to you. I have no idea where to begin! Also how much will this cost me? First, have a look at a small sample of the Funeral Home Website Design we have provided recently to Funeral Directors and appreciate the quality of our work. Then, just talk to us! We will be happy to go through the range of options and furnish you with a comprehensive quotation, tailored to your budget and needs. Give us a call at 044 93 45145 or fill in the inquiry form below! 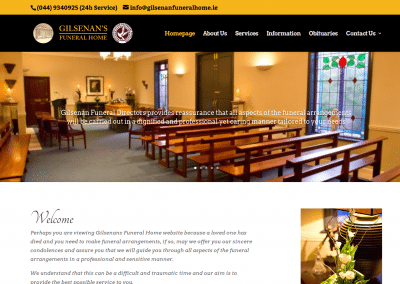 We are happy to meet with you on a one to one – so that we benefit from understanding your needs and you benefit from free consultancy from Ireland leading experts in Funeral Directors Website Design. Just enter “UPDATING ADVISE” in the contact form! We will contact you to advise what you can achieve with an updated website and give advise about costs – without obligation! Handyweb.ie will ensure your website will be Smartphone Friendly! Fill our secure form! An expert in Funeral Websites will contact you shortly!